The TD250 is an ultra-low noise, six-channel voltage amplifier with a bipolar 250V output range. 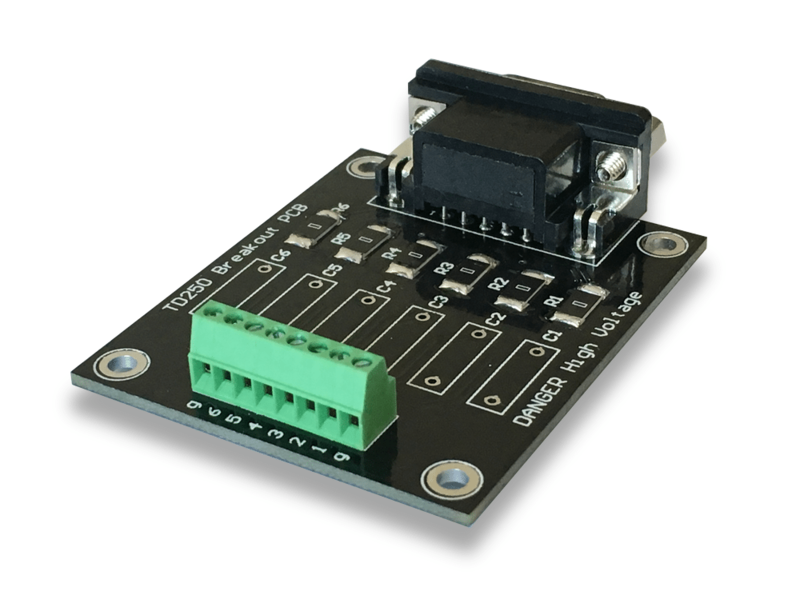 The six channels can be driven independently, or configured as three channels with non-inverting and inverting outputs, which are ideal for driving piezoelectric tube scanners. The three-channel configuration can also be used to obtain +/-500V with a bridged load. 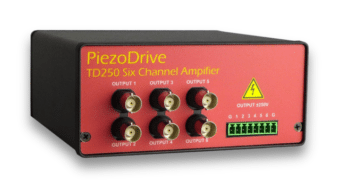 The TD250 can drive unlimited capacitive loads such as piezoelectric tubes, stack actuators, standard piezoelectric actuators, and bender actuators. Applications include, nanopositioning, microscopy, electro-optics, vibration control, and piezoelectric motors. The output connector is an industry standard 9-Pin D-Sub connector. The amplifier is supplied with a 75cm output cable and breakout PCB. A breakout box is also available which provides BNC connectors for each output and a plug-in screw-terminal connector. OEM and customized versions are also available. The standard configuration for the TD250 is three non-inverting and inverting pairs for driving piezoelectric tubes and bridged loads, the order code for this configuration is TD250-INV. 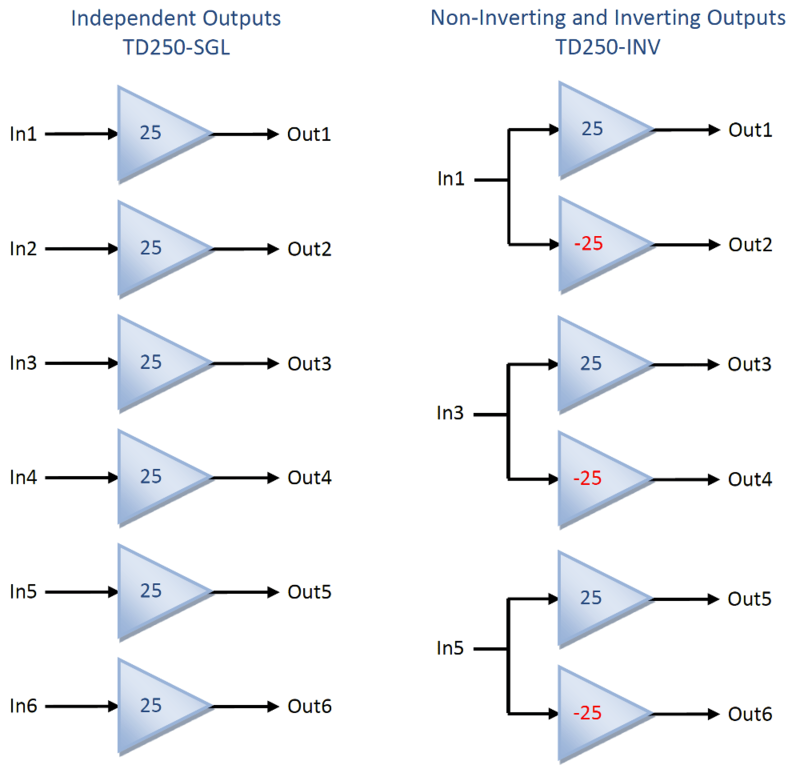 As illustrated below, the outputs can also be configured as six independent non-inverting channels, which has the order code TD250-SGL. 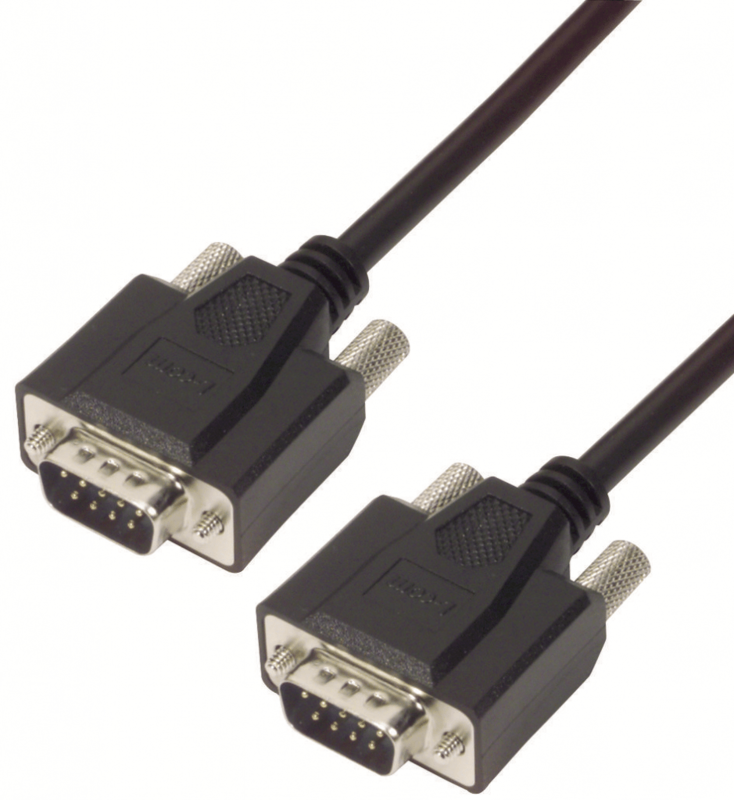 The front panel output connector is an industry standard 9-Pin Female D-Sub Connector (TE 3-1634584-2). Any Male 9-Pin D-Sub connector is compatible. The connector pinout is shown below. The voltage range, noise, and bandwidth of the TD250 have been optimized for driving piezoelectric tube scanners, for example the TB6009. Although many configurations are possible, the driven internal electrode configuration shown below is simple and provides the maximum X, Y and Z travel range. This configuration requires a tube with a continuous internal electrode and four external electrodes. In the driven internal electrode configuration, the X and Y electrodes are driven in the standard way with equal and opposite voltages. By applying the full-scale negative voltage to the internal electrode, a contraction equal to half the vertical scan range is obtained. This method exploits the higher positive electric field strength of the piezoelectric material, which is usually five times the negative electric field strength. Care must be taken not to apply positive voltages to the internal electrode, since this can risk depolarization if the tube voltage limit is less than ±500V, which is commonly true for tubes less than 1.2mm thick. Another common electrode configuration uses a separate circumferential electrode for the Z axis. This electrode is driven by a single channel with the full bipolar range. 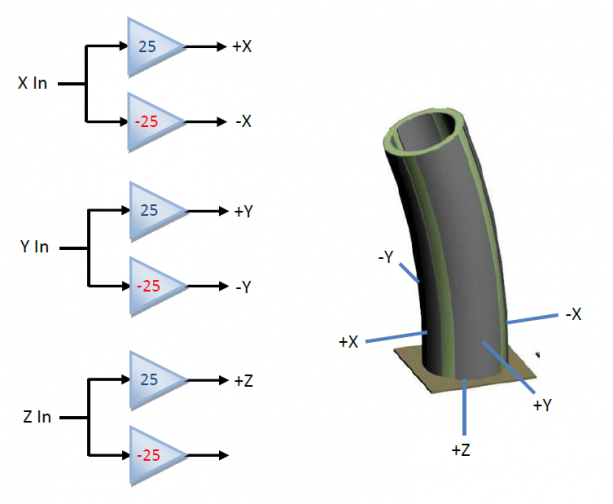 In larger piezoelectric tubes, it is possible to quarter the external and internal electrodes. The internal electrodes can be either grounded or driven in the bridged configuration. Since the bridged configuration doubles the voltage difference across the piezo material, the thickness can also be doubled which significantly improves the resonance frequency. The disadvantages of this method include increased wiring and fabrication difficulty. To obtain an output voltage range of +/-500V, the TD250-INV can used with a bridged load, as illustrated below. In the bridged configuration, the power bandwidth can be assessed by using the full peak-to-peak load voltage in the calculator, or by doubling the effective capacitance. The calculator below plots the maximum peak-to-peak output voltage versus frequency and capacitive load. 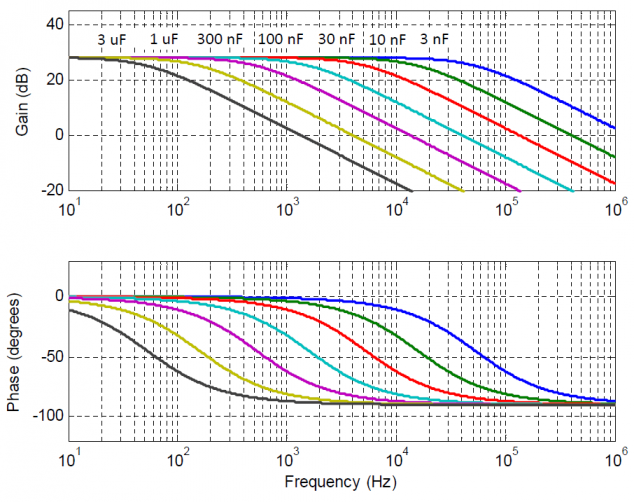 The output noise contains a low frequency component (0.03 Hz to 20 Hz) that is independent of the load capacitance; and a high frequency component (20 Hz to 1 MHz) that is inversely related to the load capacitance. Many manufacturers quote only the AC noise measured in the 20 Hz to 100 kHz range, which is usually a gross underestimate. The noise is measured with an SR560 low-noise amplifier (Gain = 1000), oscilloscope, and Agilent 34461A Voltmeter. The low-frequency noise is measured to be 50 uV RMS with a peak-to-peak voltage of 300 uV. This noise level is less than the resolution of a state-of-the-art 24-bit digital-to-analog converter. Each channel is independently protected against average and peak current overload. Exceeding these limits will result in signal distortion. The front-panel overload indicator will illuminate when the total power supplied to all channels is greater than 25W. This can occur when all channels are simultaneously operated at full power or when there is a failure of one or more channels. During a maximum power overload, the power supply is temporarily disabled and will reset once the power drops below 25W. When the amplifier is first turned on, the overload protection circuit is engaged by default and will require approximately two seconds to reset. The included breakout PCB connects to the included D-sub cable and provides screw-terminal access to the output signals. 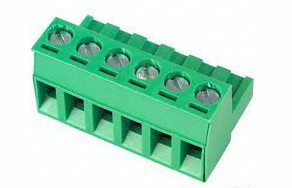 The screw terminal block can be exhanged with wires or any other connector with a pitch of 2.54 mm. The breakout PCB also includes a location for a series resistor and parallel capacitor. 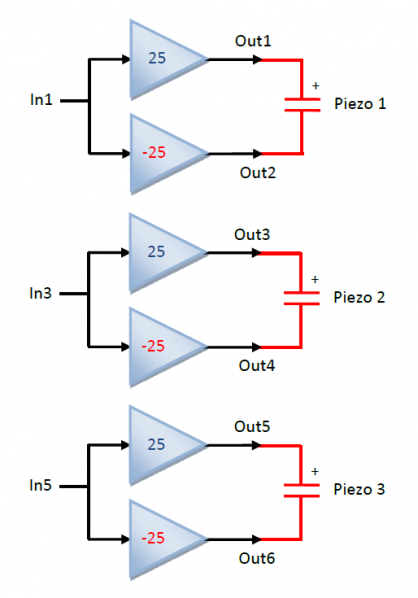 This is useful for reducing the bandwidth when using small load capacitances (< 30nF). 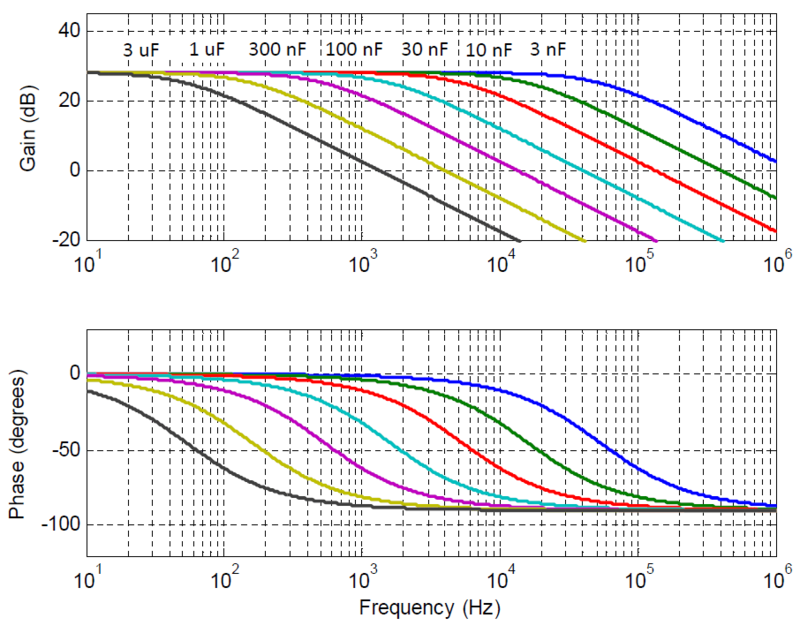 For suitable capacitance values, refer to the table “RMS Noise Versus Load Capacitance”. Note that capacitances should be a film type rated for 500 Vdc, e.g. EPCOS B32671P5104K. The breakout box provides BNC connectors for each output and a plug-in screw-terminal connector (Amphenol 20020004-D081B01LF). The breakout box connects to the amplifier via an included 75cm male-male 9-Pin D-Sub cable. A number of 300 V D-Sub cables are available for the amplifier. All are supplied with at least one 9-Pin D-Sub connector for connecting to the amplifier. The second connector is either a D-Sub connector for connecting to the breakout box, or free wires. A DSUB9-MM-75cm cable is supplied with the amplifier. The TD250 enclosure has a side air intake and rear exhaust. These vents should not be obstructed. 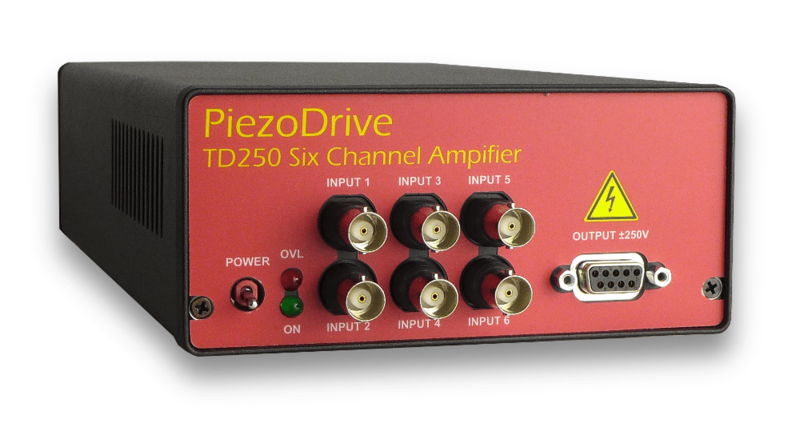 PiezoDrive amplifiers are guaranteed for a period of 3 months. The warranty does not cover damage due to misuse or incorrect user configuration of the amplifier.